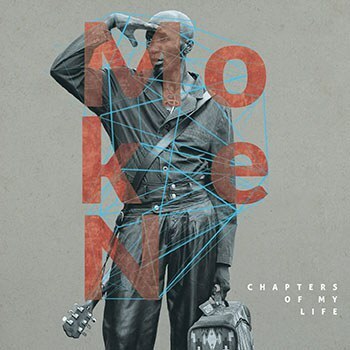 Moken’s Chapters of My Life delivers style, sass and skill to an album that you’ll never want to end. As the first note of Moken’s album Chapters of My Life plays, it is like sinking into a hot bath. Then before you know it, Moken’s deep, rich and warbling voice surrounds you and it is like nothing you have ever heard before. Hot chocolate for the ears, Moken’s vocals are silky, rich and totally moreish. A voice that oozes experience and depth, his voice effortlessly prances from pitch to pitch and experiments with countless styles within each song. The man has style, sass and a vocal range even Mariah Carey would kill for. Chapters of My Life is an album that really does take you on a journey through Moken’s life, and the countless influences he has come into contact with throughout seep through and add a quality to the music that only this type of experience could produce. So many styles and instruments go into the record that you don’t know where you are or what is coming next, you just know you never want it to end. Moken’s experience of the world is diverse, and through this he introduces all forms of Eastern and Western music into his life with influences from rock, Afro-pop, blues and other genres, most notably from singers such as Nat King Cole, Julio Iglesias, Manu Dibango, Van Morrison, and James Brown. This range of musical style has ingrained itself into Moken’s music and has created a style that is incredibly original and varied. Layers of sound are built up throughout the record, usually featuring twanging guitar and upbeat percussion, but it must be noted that Moken’s voice is like an instrument and most definitely the best part of the music. The album has a summery, feel good theme and makes you feel like you’re dancing in the sunshine, or at least wish you were. The vibrant, colorful music transports you around the world and back with effortless style and skill. Backing vocals in tracks such as “Jerusalem” and “Maliga” must be noted as they add depth and compliment the rest of the music perfectly. Stand out track “Wild Wild Ways” draws you into the album with a chilled out feel and lazy, trilling vocals until the jazzy “Waiting for the Day” ends it on a bang with experimental percussion and something that sounds a lot like maracas (and when have maracas ever not been good?). “A Bone to Grind With Einstein” is a playful song that takes a beat and just has fun with it, contrasting with a more melancholy “The Man That Never Gives Up”, which keeps the same sound but experiments with different styles and moods. Every musical craving you may have is fulfilled. Moken wants to allow you to follow him on his journey through his music, and explains that Chapters of My Life is not "just answers to my own prayers, but also a vehicle -- a medicine to ease the individual journeys of those to whom I sing.” What a guy. So if you fancy the trip of your lifetime this year but don’t quite know what that consists of, have a listen to Moken’s Chapters of My Life and I promise wherever you end up, you’ll never want it to end.